These days, it is home to Verne’s nephew, Jerry Cummins and his wife, Deb, who raised their four children there and now provide family care support to Jeff, Bruce and Rhonda who are as much a part of the family as their own four children and seven grandchildren. “The cider mill is not owned by the family anymore. It’s out in Portville, but this area here was where the mill was,” Jerry said, gesturing to the large open living area, seasoned with a nautical theme reflecting Jerry’s years in the Navy amid large comfortable furniture for the home’s many occupants. Jerry was born in the house, moved away, but returned with Deb to take care of his aging parents and her mom. Verne passed away in 2007 at the age of 95. Today, Jerry is a retired paramedic with Allegany Rescue EMS. Deb, who was a nursing assistant at Olean General Hospital where she worked with children with some disabilities, still feels a strong commitment to nurturing and supporting others. For both, it was a natural decision to support people in the Family Care program in their home. Both Jerry and Deb have a long history of supporting people with disabilities which has set the tone for the entire family. Their compassion and understanding for others is reflected in their children who are also in caring professions, and even in their grandchildren who grew up among the people the family has supported in the Cummins’ home throughout the past 25 years. “I’ve always had an overwhelming need to help other people,” Deb said. “As a child, I thought I’d like to be a nurse, then I saw a different plan. I like being able to interact with people and help them. Deb shared an incident involving her son who was a security guard at the casino at the time. When he noticed someone in a wheelchair having a seizure, he immediately stepped in to help, surprising people around him who were unsure how to react. “It’s just a seizure,” Deb recalled him saying to the people as he stepped in to help the young man. Her loving, but no-nonsense nurturing style has won her the respect of her children, grandchildren and the many people she and Jerry have supported over the years. 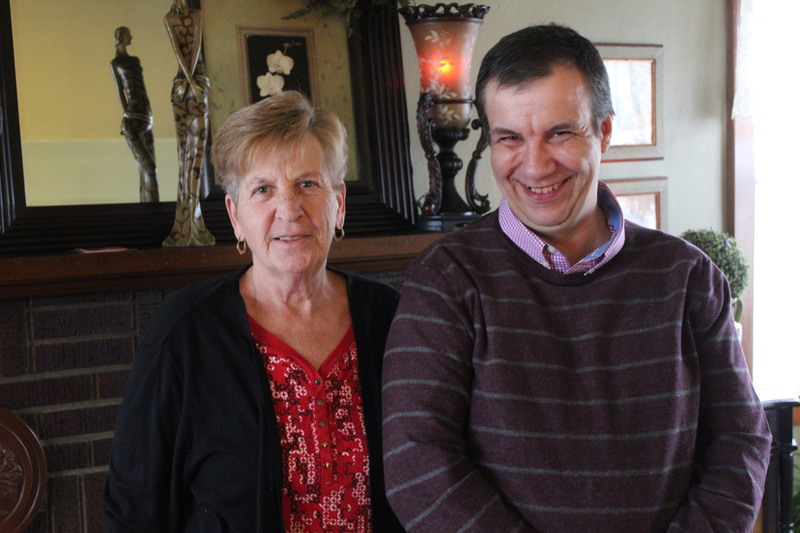 “I tell Deb and Jerry, you guys are my second mother and father,” Jeff said, smiling affectionately at Deb. “Jeff is going to stay with us as long as we can take care of him,” Deb said. Jeff worked at SubCon for 30 years on jobs from the loading dock to folding boxes and assembling cups. 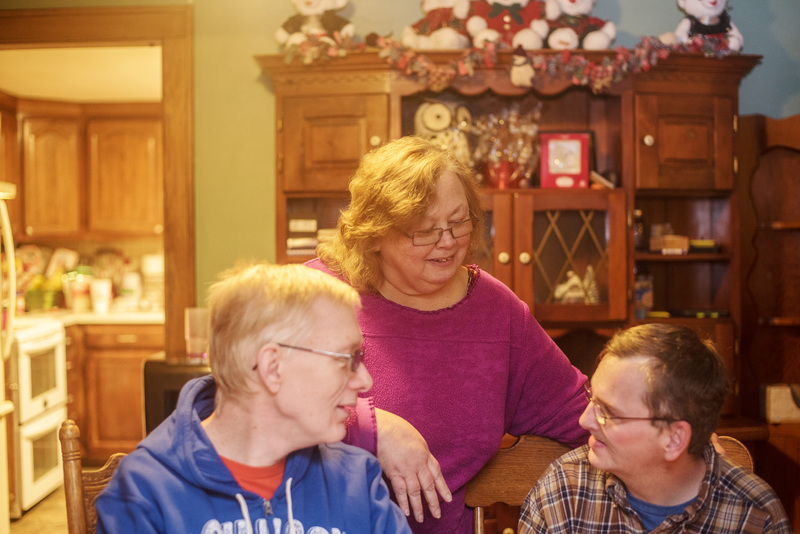 The other residents include Bruce, who has lived with the Cummins for five years and attends Continuing Day Treatment, CDT, and Rhonda who attends Lifeskills. They have bonded almost as siblings. “Jeff is like my big bro, and Deb is like, mom,” Bruce said. Before Deb and Jerry stepped up as Family Care providers, they tested the waters by providing respite which is a short term care. Suzanne Pitti and John who has lived with the family for 27 years. There are more than a dozen Family Care Providers, who provide a caring home to 23 individuals. Another caring Family Care provider is Suzanne Petti who has been providing Family Care for 27 years to John who works for the Agency’s SubCon Cleaning Solutions. He earns an income from his job and is able to purchase his own clothes and care for his own, beloved cat, Sylvester. Suzanne describes John as kind, neat, responsible and an important part of their family. Raymond, who works a the Agency’s InTandem Solutions and was formerly a person we supported, also lives in a Family Care residence. He is a perfect example of someone who has matriculated out of the Agency’s work center and is now employed in the “real world” working environment of InTandem Solutions. He began his relationship with the ReHab Center as a child in the former Children’s Learning Center. Family Care providers ensure all medical appointments are met, medications are taken on time, and encourage people to learn new skills to live more independently which include personal hygiene, cooking, recreation, employment and money management, and keeping their rooms clean. They keep a regular schedule, usually go to work or attend day services, and usually participate in family vacations and holidays. The Family Care program was started in New York State 85 years ago. The Agency’s program was begun by Mike MacWilliams in 1988. Currently, the Agency has 13 providers who support 23 people with disabilities. Difficulty of Care payment is also allocated monthly according to the needs of the individual. For more about the Family Care program, please contact Linda Cavana at 375-4747, ext. 157.